One of the more challenging aspects of riding a motorcycle is using the gears, or more specifically changing up and down gears. To change up and down gears, coordination is required between the clutch which engages or disengages the engine, the throttle which revs the engine and provides power from the engine and the gear selector. With a little practice however, it’ll soon become second nature. Essentially, if you pull the clutch lever fully in using your left hand, the engine is disengaged so you’ll not go anywhere. If you release the clutch lever and you are in gear (not neutral), the bike will move forward. If you haven’t done so already, you’ll need to gain an understanding on the gear selector lever on your specific motorcycle. How Many Gears Does a Motorcycle Have? The amount of gears that a motorcycle has varies as it depends on the particular make and model. Smaller low powered motorcycles may only have 4 gears, whilst larger modern motorcycles may have 5 or 6 gears. You’ll need to use your left foot to operate the gear lever to select 1st gear for moving off and higher gears as you gain speed. Before operating the gears, you should fully pull the clutch lever in. 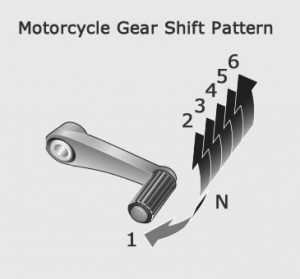 The typical gear shift pattern is as follows in the diagram. The motorcycle clutch is operated using your left hand. Use all four fingers whilst operating the clutch to avoid the hand slipping off. When the lever is fully pulled in, the engine is disengaged and so the clutch can be squeezed in as quickly as you like (think the engine has been disconnected from the wheels). When the clutch is fully released, the engine is engaged (engine is connected to the wheels). At some point between the clutch being disengaged and fully engaged is the biting point. The motorcycle clutch biting point is where clutch effectively begins to connect the wheels to the engine and if this is done to quickly, it may result in a sharp jolt of the vehicle. It’s important then to release the clutch slowly until you understand where the bite point area is within the working travel of the clutch. When you gain more experience, you will only need to squeeze the clutch in just past the biting point and not all the way to the grip. Motorcycle clutch biting points vary in location depending on the particular make, model and how much wear the clutch has had. Changing up a gear on a motorcycle is required when the motorcycle is moving at a higher speed and when the engine is moving at a higher speed (revving faster). There’s no specific time that can be said for when to change up a gear as each motorcycle is different, plus it also depends on whether you are riding up or down a hill or on a level surface. Use this same method each time you intend on changing up a gear on your motorcycle. If you are in too higher gear for the speed you’re doing, the engine will not provide you with enough power to accelerate, so you will need to change to a lower gear to match the slower speed you are traveling. If traveling downhill, changing to a lower gear enables your motorcycle maintain a steady speed rather than increasing speed (when throttle is closed). This is called engine braking.